Compact size digital force gauge designed for measuring the vertical tracking force(VTF) of vinyl record machine stylus. The detachable cantilevered extension arm with 20g capacity and 0.005g accuracy provides accurate measurements of tracking force. Designed with a polymer pad on the extension arm for protecting the stylus tip and allowing stylus center on the measurement platform. Supports multiple weighing units(g/ct/dwt/ozt/gn/T/oz ); and with 5 digits LCD display for easy reading measurement information. 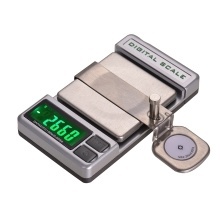 Can be used as a normal electronic scale with 100g capacity and 0.005g accuracy to weight small items.